Sorry I've been gone, but I've been on the greatest adventure! My girls went together and bought me a plane ticket to go to the wedding of one of my adopted-surrogate kids! My boy, Jake, got married and I'm so glad I was able to go and share that day with him! I was lucky enough to spend time with Nichole and Lainie Loo, and my Jennifer, Nick and sweet Emma which I totally loved! For me, there's nothing like spending time with my children and grandbabies! I could just eat them up I love them all so much! I also got to spend so much time with my other kids. Jake used to live with us for a couple of years and while he may not be my biological child, he is a child of my heart, just like my Nicole, Kelly, Rachelle, Bryce, Brolin, Ben, Zach, Ryan with a silent "B". There's something to be said about taking time to spend with children and listening to them. I shared so much of their lives with them and they had such an impact on me. They made me feel needed and loved. I thought it was just on my side, but gosh, how humbling it is when you realize that you had an impact on them and they truly love you as much as you do them. My heart was very full and overflowing this weekend and I realize how truly blessed and extremely lucky I am. Boy, did they all ever work me over and made me feel like I need to be back in Maine with them. Well, who knows what the future may bring. I may still have a few winters left in my heart that I've been ignoring! Thanks for letting me ramble on! Now on to my project for today! 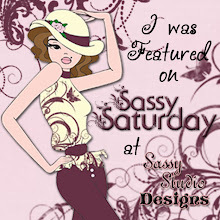 Sassy Studio Designs is sponsoring the challenge over at C.R.A.F.T. and their theme is Birthdays. How much fun are birthdays?! I've always loved them and don't mind counting them.l After all, age is only a number and not a frame of mind. That's what I think. I certainly don't feel as old in my heart as I am in numbers. 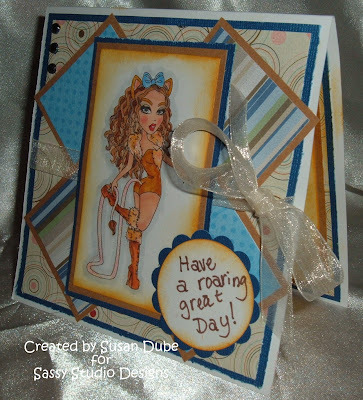 I decided to use Cowardly Lion Sassy from Sassy Studio Designs' newest release. I just love all of the images in this release! Isn't she just sassy? She's colored with copics and I used some Stickles on her fur and tail. 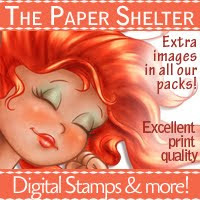 The papers are from Bo Bunny and from my stash. The gems are from Recollections and I added some Distressed Inks around the edge of her. Doesn't she have the prettiest face? The sentiment is handwritten with Allie. We're working on her letters and she wanted to help. After my past weekend. I don't want to stand in the way of her wanting to practice writing or being creative. So stop on over at the C.R.A.F.T. 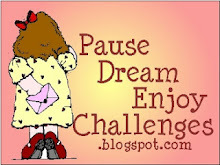 Challenge and join in on the fun. 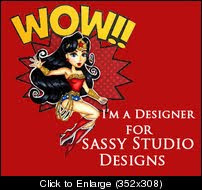 And use a Sassy Studio Image is you have one! They're so much stinkin fun! Susan, what a lovely creation! 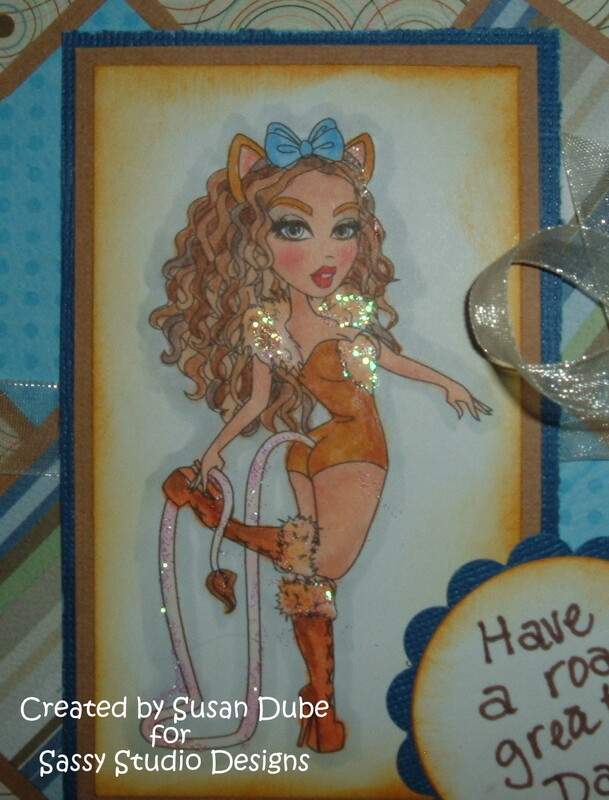 Love the layout of this card and the sparkle (of course). Really cute sentiment. Love the colors and layout Susan. She is beautiful. Sassy is right! Love the sparklies! Oh she is roaring alright with all that sparkle! I love it Susan. Gorgeous creation, love the colours & layout & that sentiment is just perfect! Thank you for sharing with us at The Stamping Chef, good luck! Thanks for playing along with C.R.A.F.T. 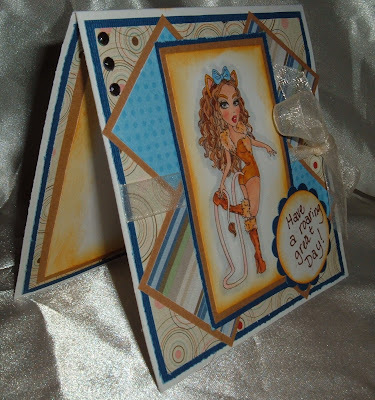 bloghop birthday challenge! And Wish you good luck in the draw!